Conventional wisdom says that forests prevent flooding by acting as giant sponges. Tree roots, the forest soil and leaf litter soak up water during heavy rainfall, delaying or even altogether preventing its arrival in nearby watercourses. Contrary to such popular belief, the report says, in reality the forests have only a limited effect on major floods. It is true that, on a local scale, trees can reduce the volume of water arriving in nearby streams and rivers, or at least, spread its arrival over a greater time span. However, this holds true only for relatively short periods of light, drizzly rain over small areas. If the rain is heavy, prolonged and falls over larger areas, the presence of trees will not prevent catastrophic floods. This is because, when major floods do occur, it is most often towards the end of the rainy season, when heavy rain falls on areas that are already waterlogged. That is to say, the giant sponge that is the forest has already become saturated. 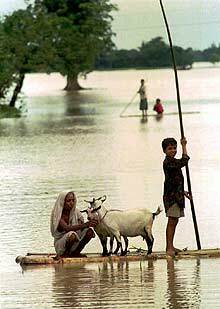 The report, "Forests and floods: drowning in fiction or thriving on facts? ", was compiled by researchers based at the Centre for International Forestry Research-a research institute based in Bogor, Indonesia, dedicated to forest conservation and human welfare-working with a host of other international teams. It was published in collaboration with the UN's Food and Agriculture Organisation.